The Timecode Adapter Cable from Remote Audio features a 5-pin LEMO male connector (TC out) on one end and a 4-pin LEMO male connector on the other. It can be used to transmit timecode from a TC generator or receiver with a 5-pin LEMO connection to cameras like the Red Epic or Scarlet or any device with a 4-pin LEMO input. 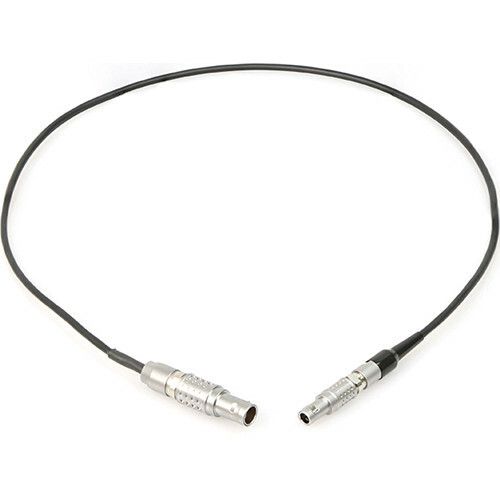 The cable is built with professional-quality Mogami and Remote Audio brand components. The cable length is 18". Box Dimensions (LxWxH) 6.2 x 2.7 x 1.5"
Timecode Adapter Cable 5-Pin LEMO Male to 4-Pin LEMO Male (18") is rated 1.0 out of 5 by 1. Rated 1 out of 5 by Marcus from Doesn't do anything I purchased this item after reading the Q&A that this is what is needed to sync the Sound Devices 702T to the Red Epic Dragon. Absolutely nothing happens when I connect the cables together regardless of settings on either device. Called both Sound Devices and Red and they are supposed to sync up just fine with this cable. I am not yet sure if it was just a bad cable since B&H sent me a canned response RMA after I asked them to send me another one. Going to have to research this one a bit more and possibly go with the Red BNC to Lemo cable, rather not waste time going back and forth with B&H. i was wondering if this is the cable that will let me sync my Sound Devices 633 to Red epic/Scarlet Cameras? Yep! It's what we use for the exact same purpose. We bought a knock-off one first, and that didn't work. This is great.